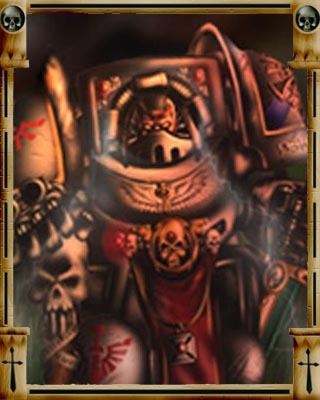 Lucian (Two heads Talking) may only be used if atleast one Deathwing terminator squad is present in the army. Shield of Ancestors: Lucian is protected by the cumulative psychic powers of his shaman ancestors. Before battle he can call upon them to create the illusion that his massive terminator armoured figure appears as a friendly figure to the enemy. This lasts until he opens fire, goes in to close combat or is within 3" of an enemy. Once he is recognized the power cannot be used again. The effect also protects any squad that accompanies him. WHile under the protection no enemy can target him. Hates Genestealer Broods: His haterd for genestealer cults is only overcome by the knowledge of the importance the cult leaders play. Lucian will attempt to engage any genestealer patriarch or magos disregarding all others by ranged fire and move directly towards them by the shortest route to close combat ignoring all other threats. A squad accompanying him may do the same. Death Agony: Lucian's supreme will continues to battle his enemies even with his dying breath. If Lucian is killed in close combat, he fixes his killer's mind with his own, linking the two as he dies, dragging his enemy to his doom. If |Lucian is killed in close combat the model that struck the last blow must roll under his Ld value or suffer an instant death with no saves. Brother Librarian Lucian was born on the Plains World, the first recruitment home for the dark Agels after the destruction of Caliban and was known amongst his people as Two Heads Talking. Brother Lucian in his ancient mark II Tactical Dreadnought Armour after the cleansing of Thranx, where only his strength of will averted complete disaster. Wargear: Tactical dreadnought armour, Psychic Hood, Force Axe, Master-crafted storm bolter. Brother Bethor was the third battle company's standard bearer under the command of Master Gabriel. During the Cleansing of Durganion XIII, he single handedly recovered the Third Company standard that had been captured by a genestealer brood. Hisbravery was rewrded by his promotion as the bearer of the Sacred Standard. Only one of the three standards are ever deployed at any one time and always under the care of Brother Bethor. The three sacred standards date back to the time of the great crusade and have a deep cultural significance to not only the chapter but their successors too.